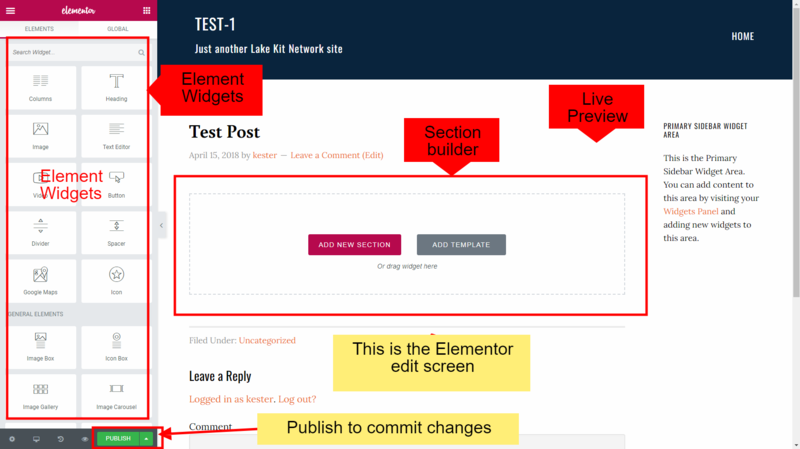 Pre-2018 Lakekit.net sites will be transitioning from the Weaver Xtreme theme to Genesis, using a drag and drop page builder called Elementor. First, a word of warning: developers are constantly enhancing their products and programs, and Elementor is no exception. Over time, these instructions may not perfectly match the sequence of steps needed to perform an operation. If you encounter a problem, you can first try checking out the documentation at Elementor.com. There is a huge body of information on the web about using Elementor, so you can also do a general web search. If you still don’t have an answer your question, you can send an inquiry by using the Contact Us link on the lakekit.net Home page or post the question to the lakekit.net support Forum. Instructions, including this documentation and information on using Elementor and working with menus. General Guide, which includes tips on working with widgets, adding links, etc. Forums, which is a place to ask questions and get help from other Lakekit.net members. Enter a title for your page, such as Test Page and click the blue Publish button on the righthand side of the screen. Then click the blue Edit with Elementor button. The Elementor edit screen is made up of three important sections. While you generate your content by creating spaces and dragging widgets onto the page or post, please remember to click on the green “Publish/Update” button to save your changes. Drag the Text Editor widget from the Widgets area on the left to the section builder on the right. When hovering over a widget, a blue pencil icon appears at the top right hand corner of the widget. By clicking on the pencil, you will open up the content editor. Content is edited in the left hand column, which is the editing panel. After clicking on the pencil icon, you can edit the text of a section by deleting old text and/or typing your new text in the left hand column, which is the editing panel. Do not edit in the area on the right, which is the Live Preview panel because you can’t always be certain where your cursor is located, and not all editing functions may be available to you in the Live Preview panel. When you have finished your edits, click the green “Update” button to update the content. A number of options are available to you when editing text, such as putting text in boldface and/or italic type, underlining, changing the color of the text, making the text into bullet points, and more. After clicking on the pencil icon, these features are available in the left hand column (Text Editor). To return to the list of widgets, click on the 9-dot icon at the upper right corner of the left sidebar. Become comfortable with the Elementor editor, adding sections, using widgets, navigating back to the dashboard. Sections are row (horizontal) areas in the Elementor editor. Go to Dashboard -> Templates -> All -> Header -> Basicsite-2 Header-b -> Edit with Elementor). Create a new browser tab and add the image to use into the Media Library if it is not already there (Dashboard -> Media -> Library -> Add New -> Select Files). The image should be at least 1400 pixels wide. Suggested image height is 200-300 pixels. If the image is not sized before adding it to the Media Library, it can be modified at Dashboard -> Media -> Library -> Hover over the image and click “Edit”. Back in the Elementor editor, hover over the main section. A blue section icon set will appear at the top center just above the image. Click the center icon (6 dots) to reveal the section editor in the left Elementor sidebar. Click to get the Section widget in the Elementor sidebar. Select the Style tab and then the Background section. Hover over the image and click “Delete”. Next click the blank image area and maneuver to the new header image in the Media Library. Select the image and insert it (bottom right). Click the Update button in the Elementor sidebar to save the edits. Click the site title. This should reveal the section outline with 3 columns. Hover over the 3 column outlines and find the vertical drag icon in between 2 columns. Drag the vertical line left or right to reposition the title text horizontally. A vertical spacer widget is located below the site title text. Click the upper right pencil icon for the spacer. In the Elementor sidebar, change the space up or down to reposition the title vertically. Another vertical repositioning option is to change the top margin of the section containing the 3 columns. Hover over the section the Title widget is in (top center just below the image top) to reveal the section icons for this section. Click the pencil icon in the margin boxes to break the all-margins edit choice. Use the up/down icon in the top margin box to move the title up or down. Click in the menu line to reveal the Nav Menu widget. A simple modification might be to change the menu text color. Click the Style menu and then the Normal button. Click the text color box, then change the color using the various options presented. If using a practice page you may want to apply the header to one page as a test. The Elementor header or footer templates may be applied to any page. This feature both allows displaying different headers or footers on a site and devising a new header or footer before making it live on a site. To apply a header to a specific page, follow the instructions here and click on Apply Header or Footer to Specific Pages. For additional documentation on conditions, visit this link. Go to Dashboard -> Templates -> All -> Header -> Basicsite-2 Header-b -> Edit with Elementor. Click “Save Options” arrow to the right of Update button in the Elementor sidebar. Go to Dashboard -> Templates -> All -> Footer -> Basicsite-2 Footer -> Edit with Elementor. Click the “Save Options” arrow that is located to the right of Update button in the Elementor sidebar. Click on “Display Conditions” and delete any existing conditions. Then click “Add Condition” and choose “Entire Site.” Click on the green Save and Close button. Move all content in Sidebars to a new section using the Elementor Editor. After content is moved, remove the sidebars on each page in Weaver Xtreme (in Layout, choose “No Sidebars, content only” then remember to click on the blue Update for the page). On the Dashboard, click on Pages -> All Pages and choose the page that has your current Contact Form 7. Click Edit (not Edit with Elementor) and remove the content from the page that relates to the old Contact Form 7 (it will be a code). Update the page. Click on Edit with Elementor.